Sanctuary is set in a beautiful organic garden above the tiny village of Westminster West, just 15 miles north of Brattleboro. 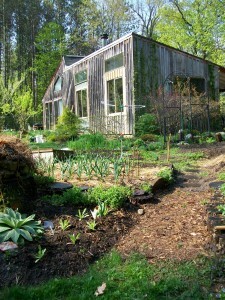 A peaceful, magical setting surrounded by forest, birds, flowers, wildlife. We have one very special guest room with its own private entrance into the garden, a queen-sized bed and a private half-bath. 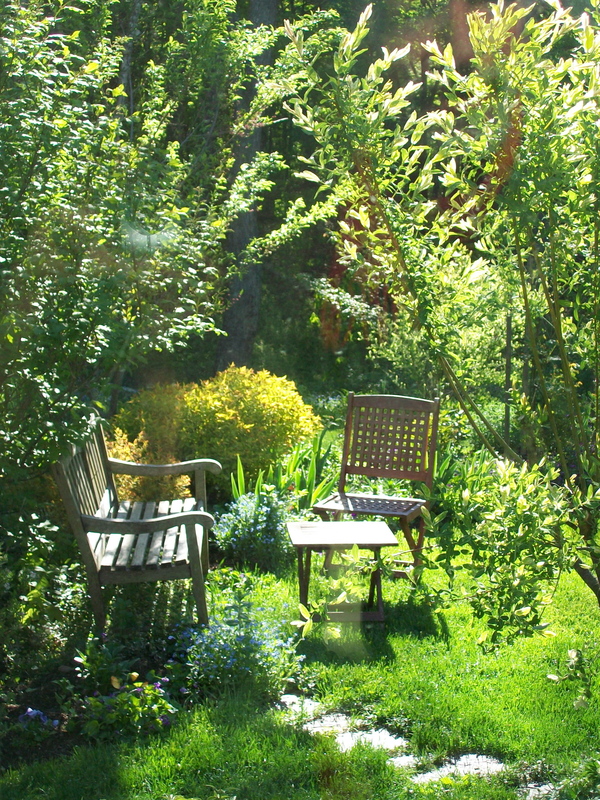 An ideal accommodation for couples, artists, writers and those seeking a quiet getaway. We happily provide a simple delicious breakfast. Special diets will be cheerfully accommodated: vegetarian, vegan, no-wheat, no-dairy, etc. 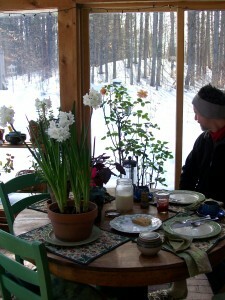 Generally, breakfast is served in the sunroom or the large living-dining room, or in the garden in season. Winter breakfast in the sunroom. We have devised a way to give guests a private sitting room by using shoji screens to separate the platform at the south end of our large living room from the rest of the room. 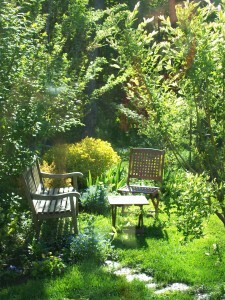 It is the perfect place for yoga, meditation, reading, writing, relaxing, surrounded by beautiful plants inside and out. We can accommodate an extra person on a futon in the sitting room, for an additional charge. We are not set up for children or pets, but are willing to consider your needs. Rates and details about your stay. 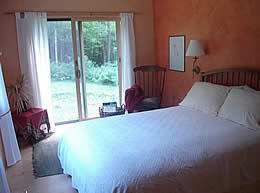 For reservations or more information, contact us by email: info@sanctuaryvermont.com, or phone (802) 387-5779. Sanctuary is set on a knoll above the picturesque village of Westminster West. We are seven miles from the center of Putney (10 minutes) and 15 miles from Brattleboro (25 minutes). The drive to anywhere from here is through beautiful forested hills, organic dairy farms, picturesque New England villages. Click on Directions to Sanctuary for specifics on how to find us.